Duo Country humoristique US formé en 1932. Homer Haynes né Henry Doyle Haynes, le 27 Juillet 1920 à Knoxville (Tennessee), décédé le 7 Août 1971 et Jethro Burns né Kenneth D. Burns le 10 Mars 1920 à Conasauga (Tennessee), décédé le 4 Février 1989. Known as "the thinking man's hillbillies," Homer Haynes and Jethro Burns got a lot of mileage out of an act that shouldn't have lasted or gone as far as it did, at least on the surface of things. Certainly there were other, far more established duos mining similar turf on the country music circuit, with Lonzo & Oscar leading the way. 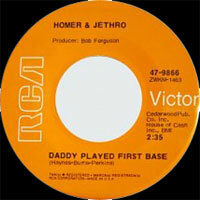 But Homer & Jethro were far more than just two hayseeds doing cornball send-ups of pop tunes. Underneath the cornpone facade were two top-flight musicians with a decidedly perverse sense of humor and a keen sense of satire. Homer D. Haynes was the older of the two men, born in Knoxville, TN, on July 27, 1918. 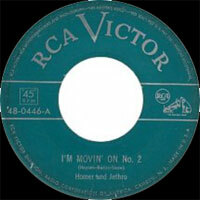 Jethro was born with the decidedly non-show biz moniker of Kenneth D. Burns also in Knoxville on March 10, 1923. The duo met in their early teens and started playing music together almost immediately, with Haynes on guitar and Burns alternating between mandolin and banjo. In the mid-'30s they began working on local radio station WNOX as part of a larger group, the String Dusters. One night, the boys heard a radio broadcast of a pop singer doing a broad — and fairly denigrating — takeoff of a hillbilly singer singing a country tune. Using exaggerated vowel and consonant stressing (trademarks of bluegrass singing) and deliberately going off-key as much as possible, the singer's performance irked the duo to no end. They decided right then and there that payback was the only logical solution to this kind of insult. From here on out, they would take current popular songs and send them up as hillbilly renditions, performed in deadpan earnest by Haynes and Burns, who now took the stage name of Jethro. They started working in the act while the rest of the group took a break during the broadcast. The new duo's "intermission" turn proved to be immensely popular and within four years' time, their characters and their timing were fully honed to a razor edge. By 1938, they had broken off from the String Dusters and moved up to the more prestigious Renfro Valley Barn Dance, later broadcasting on the Chicago-based Plantation Party. 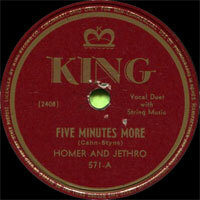 World War II split the duo up, with Homer serving in Europe and Jethro serving in the Pacific theater. Getting back together after their respective discharges, they started up their radio appearances again, this time working on the Cincinnati-based Midwestern Hayride. Their recording careers also began during this time period, signing with King Records out of Cincinnati, issuing several 78s between 1946 and 1948. By the end of the year, country producer legend Steve Sholes had signed them to RCA Victor, where they would spend the rest of their recording careers, cutting records — especially in the '60s — as if nothing could contain them. 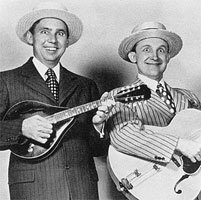 The duo joined up briefly with Spike Jones & His City Slickers, appearing in the stage show for a while, recording at least one session with him in 1950 ("Pal-Yat-Chee"), and letting Jones' agency handle all their bookings. It was in the late '40s into the 1950s, basing themselves out of the Windy City, that the duo hit their true stride. Their first big hit was a takeoff on "Baby, It's Cold Outside" with a quite young June Carter contributing on Vocalss. The success of this single brought them to the attention of powerful radio station WLS, thus securing Homer & Jethro a regular spot on the National Barn Dance. Joining in 1949, the duo would stay faithful to the original version of the Grand Ole Opry, staying with the show until 1958. The national hookup did wonders for their career, which got an added boost when they started working double duty as regulars on Don McNeil's Breakfast Club, one of the top-rated morning-radio chat shows of its time, also based out of Chicago. The 1950s found them scoring big with numerous guest shots on television. The beauty of Homer & Jethro (as opposed to another country novelty act) was that they could work anywhere and be understood. They could be on the bill with Roy Rogers or trading cornball putdowns with Jimmy Dean or slickly one-upping Johnny Carson, and they always held their own. As time went on, their act became more deadpan and, if anything, even more polished, as if to distance themselves from everything else that had existed before them in their little corner of the country world. State-fair work was replaced with the glitzier surroundings of Las Vegas and the like. 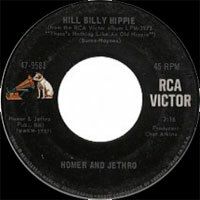 RCA Victor Living Stereo album covers aside, Homer & Jethro never had to dress up in bib overalls and play hicks to get their act over. If anything, the straighter they dressed and the straighter they acted, the funnier they were. They were still singing with broad accents, but the satires were getting more acerbic with each release, giving rise to their lasting sobriquet as "the thinking man's hillbillies." 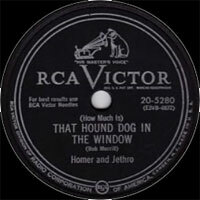 Their satire of Patti Page's "How Much Is That Doggie in the Window?" (Homer & Jethro'd into "How Much Is That Hound Dog in the Winder?") became their first crossover hit in 1953. In 1959, the duo won their first — and only — Grammy award for "The Battle of Kookamonga," their hilarious spoof of Johnny Horton's "The Battle of New Orleans," a country crossover record that cut a wide swath on the charts that year. When Southern country humor became a small phenomenon of the 1960s with the success of television shows like The Beverly Hillbillies, Petticoat Junction, and Green Acres, Homer & Jethro's career went into overdrive. They (and RCA Victor) released an avalanche of records like there was no tomorrow, issuing eight albums of new material between 1966 and 1967 alone. Their studio efforts were produced by Chet Atkins with the cream of Nashville sidemen, and one album, Playing It Straight, found them in an all-instrumental setting, showing there were chops aplenty behind the cornball Vocalss and broad satires. The duo also participated in a wildly successful advertising campaign in the mid-'60s for Kellogg's Corn Flakes, even issuing an album based on the ad's catch phrase, Ooh, That's Corny!, to brisk sales. The duo continued until Homer's death in 1971. Jethro went into semiretirement for a few years, being coaxed back into show business by folksinger Steve Goodman, who brought him out on tour, spotlighting him to much recognition as a fine jazz-influenced mandolinist. 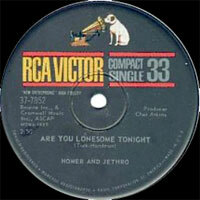 Homer & Jethro were inducted into the Country Music Hall of Fame in 2001. 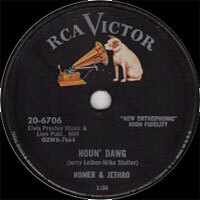 01/1950 78 t. RCA VICTOR 21-0169 (US) . HOMER & JETHRO & June CARTER - I Said My Nightshirt (And Put On My Pray'rs) / (Put Another Nickel In) Music! Music! Music! 01/1950 SP RCA VICTOR 48-0181 (US) . HOMER & JETHRO & June CARTER - I Said My Nightshirt (And Put On My Pray'rs) / (Put Another Nickel In) Music! Music! Music! 06/1950 SP RCA VICTOR 48-0349 (US) . Poison Pete / ? 12/1950 SP RCA VICTOR 48-0404 (US) . Oh Babe / ? DISC 2 : The Moon Of Manakoora / On A Slow Boat To China / Baby, It's Cold Outside / Have I Stayed Away Too Long? 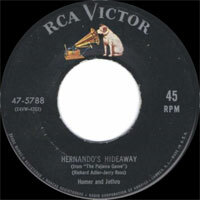 02/1957 SP RCA VICTOR 47-6765 (US) . I'm My Own Grandpa / ? 06/1958 SP RCA VICTOR 47-7277 (US) . Rock Boogie / ? 07/1968 SP RCA VICTOR 47-9581 (US) . Hill Billy Hippie / ?